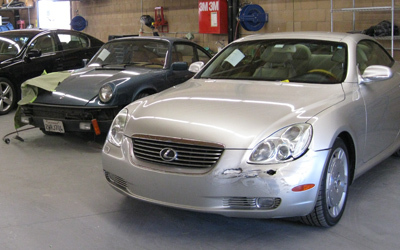 Dynamic Collision Center is a full-service body shop in every sense of the word. We have five state-of-the-art facilities to serve customers throughout Southern California. Each of our state-of-the-art repair facilities offers exceptional craftsmanship, computerized paint matching, and a wide range of affordable collision repair services. At Dynamic Collision Center, we also pride ourselves on working with you to make the repair process as easy and transparent as possible. Being in an auto accident or needing collision repair is stressful enough - we will work with your insurance and take care of all the paperwork, so you won't have to! Dynamic Collision Center is where you can count on speed and perfection. From conventional bodywork and paint services to cosmetic reconditioning, or interior refinishing to even professional auto detailing, Dynamic Collision Center is your one-stop-shop for auto body repair in Southern California. Whether you've got frame damage or a bruised bumper, we do it all, professionally and in a timely manner! Visit one of our five Southern California locations, proudly serving Cerritos, Garden Grove, Redlands, Victorville, and Coachella Valley. Get location and contact information for your local Dynamic Collision Center auto body shop, and get started today!